Raul Jimenez had five shots on goal before opening the scoring with his sixthBurnley's search for their first Premier League win of the season goes on as Wolves claimed a deserved victory at Molineux to continue their strong start to the campaign.After the hosts dominated large periods of the first half, Raul Jimenez deservedly opened the scoring for the home side on the hour mark as he turned in Matt Doherty's cross.The Clarets rarely threatened, with the only real chances they created falling to Johann Berg Gudmundsson late on. Defeat for Sean Dyche's side means they have equalled a club-record run of four consecutive Premier League losses. Neither team was able to impose themselves in the opening 20 minutes, with the only save of note being Joe Hart's smart intervention to keep out Helder Costa's dangerous cross.But from then on it was all Wolves and only a combination of Hart and James Tarkowski kept the home side at bay after 30 minutes when Jimenez, Jonny Otto and Doherty all went close.Jimenez also missed a good chance early in the second half when he blasted over with only defender Charlie Taylor to beat, but he made amends shortly after when he opened the scoring.Victory for Wolves means they climb to ninth, meanwhile Burnley remain in 19th with just one point from their first five games. 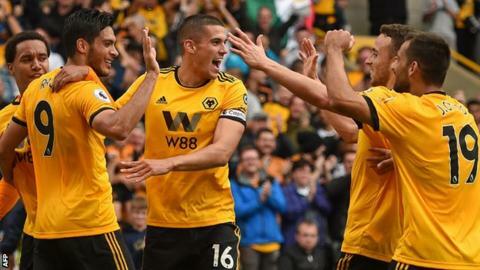 In his pre-match news conference, Wolves head coach Nuno Espirito Santo called for his players to "maintain the standards" set in their 1-0 victory over West Ham prior to the international break, and he was not disappointed.Last season's Championship winners were by far the brighter team throughout, putting Burnley under sustained periods of heavy pressure either side of the break.They really should have gone ahead on the half-hour mark when first Hart superbly saved to deny Jimenez, before Tarkowski was there to clear the Mexico striker's second effort off the line.Just moments later, Tarkowski was again alert to clear Otto's effort after Hart had palmed clear a low cross, and the former England keeper was then quickly out to smother Doherty's sliding effort from close range.And after Jimenez finally found the net midway through the second half, the home side only got stronger largely due to the introduction of Adama Traore after 66 minutes, his pace causing a tiring Burnley backline problems.The Spanish forward tested Hart himself before laying on three good chances for fellow second-half substitute Leo Bonatini, who was unable to convert.Victory for Wolves means their impressive home record under Santo continues; his side have only been beaten twice at Molineux in his 29 games in charge. Burnley perhaps could have been forgiven for their poor start to the Premier League season given their Europa League exertions but after the international break, there could be few excuses for their uninspiring performance.Their midfield was overrun by Wolves' energy and Ashley Barnes' effort from range, which was easily saved, was his side's only shot on target in the opening 45 minutes.It seemed to take conceding a goal for the team to kick into gear, as their best chance came shortly after going behind when Willy Boly almost deflected a Taylor shot inches wide, with Jack Cork unable to apply the finishing touch.But it could have been worse for Burnley as Doherty fired wide with only the keeper to beat after being set up by Traore, while Bonatini missed a spate of chances.Iceland winger Gudmundsson, on his return from injury, could have stolen a share of the spoils late on, but he shot straight at Rui Patricio and fired a free-kick over the bar.The Clarets have now won only five of their last 26 Premier League outings.Dyche, however, will have been encouraged by the performances of Hart and Tarkowski, who once again showed why he has fought his way into the England fold. Wolves head coach Nuno Espirito Santo, speaking to Sky Sports: "I am very, very satisfied. We played good football and stayed organised and created chances. Burnley are a good side and stayed in it until the end. "If there is a 'but', we could be more clinical. But if we can continue to make these many chances, it makes me very proud. "Burnley manager Sean Dyche, speaking to Sky Sports: "We knew they were a good side. They invested well in the summer. We knew we'd have to defend resolute. We got some nice blocks in and looked more like ourselves defensively. "Attacking-wise there was nowhere near enough. We are in a bit of a fog at the moment. Collectively we need to get out of it. You have to work to change it so that's the key." This is Burnley's worst start to a season in the top-flight (one point from five games) since 1927-28, when they lost each of their opening five matches. Wolves have won all three of their Premier League meetings with Burnley, against no other side have they recorded a 100% win ratio. Burnley have never won a Premier League away game against newly-promoted opposition (W0, D6, L5). Wolves have lost just one of their last 24 league games at Molineux (W16, D7, L1). Wolves recorded more shots (30) against Burnley than they have against any other side in a single match in the Premier League. Burnley have now conceded 10 goals in their opening five league games this season; it took them 13 matches to concede their 10th goal of 2017-18. Each of Matt Doherty's last four goal involvements in the league have come at Molineux (two goals, two assists). Match ends, Wolverhampton Wanderers 1, Burnley 0. Posted at 90'+5' Second Half ends, Wolverhampton Wanderers 1, Burnley 0.Posted at 90'+4' Attempt missed. Leo Bonatini (Wolverhampton Wanderers) right footed shot from the centre of the box is close, but misses to the left. Assisted by Adama Traore.Posted at 90'+2' Adama Traore (Wolverhampton Wanderers) wins a free kick on the right wing.Posted at 90'+2' Foul by Ben Mee (Burnley).Posted at 90'+2' Attempt missed. Leo Bonatini (Wolverhampton Wanderers) right footed shot from the centre of the box is too high. Assisted by Adama Traore.Posted at 90' Attempt saved. Johann Berg Gudmundsson (Burnley) right footed shot from outside the box is saved in the centre of the goal. Assisted by Matej Vydra.Posted at 89' Foul by Ryan Bennett (Wolverhampton Wanderers).Posted at 89' Matej Vydra (Burnley) wins a free kick in the attacking half. Posted at 88' Substitution, Wolverhampton Wanderers. Morgan Gibbs-White replaces Diogo Jota.Posted at 87' Attempt missed. Johann Berg Gudmundsson (Burnley) left footed shot from outside the box is just a bit too high from a direct free kick. Posted at 86' Ruben Neves (Wolverhampton Wanderers) is shown the yellow card for a bad foul.Posted at 86' Foul by Ruben Neves (Wolverhampton Wanderers).Posted at 86' Aaron Lennon (Burnley) wins a free kick in the attacking half.Posted at 84' Attempt missed. Diogo Jota (Wolverhampton Wanderers) right footed shot from outside the box misses to the left. Assisted by Willy Boly.Posted at 84' Attempt blocked. Ruben Neves (Wolverhampton Wanderers) right footed shot from outside the box is blocked. Assisted by Diogo Jota. Posted at 82' Charlie Taylor (Burnley) is shown the yellow card for a bad foul.Posted at 82' Adama Traore (Wolverhampton Wanderers) wins a free kick in the attacking half.Posted at 82' Foul by Charlie Taylor (Burnley).Posted at 81' Attempt blocked. Leo Bonatini (Wolverhampton Wanderers) left footed shot from the centre of the box is blocked.Posted at 81' Attempt blocked. Leo Bonatini (Wolverhampton Wanderers) left footed shot from the centre of the box is blocked.Posted at 81' Diogo Jota (Wolverhampton Wanderers) wins a free kick in the defensive half.Posted at 81' Foul by Phil Bardsley (Burnley).Posted at 80' Attempt missed. Leo Bonatini (Wolverhampton Wanderers) left footed shot from outside the box is close, but misses to the right. Assisted by Ryan Bennett.Posted at 80' Attempt blocked. Jonny (Wolverhampton Wanderers) right footed shot from the left side of the box is blocked.Posted at 80' Attempt blocked. Diogo Jota (Wolverhampton Wanderers) left footed shot from the centre of the box is blocked. Assisted by Matt Doherty. Posted at 79' Substitution, Burnley. Ashley Westwood replaces Jeff Hendrick. Posted at 76' Substitution, Wolverhampton Wanderers. Leo Bonatini replaces Raul Jimenez.Posted at 76' Attempt missed. Matt Doherty (Wolverhampton Wanderers) right footed shot from the centre of the box misses to the left. Assisted by Raul Jimenez. Posted at 72' Diogo Jota (Wolverhampton Wanderers) is shown the yellow card for a bad foul.Posted at 72' Foul by Diogo Jota (Wolverhampton Wanderers).Posted at 72' Phil Bardsley (Burnley) wins a free kick in the defensive half.Posted at 71' Attempt saved. Adama Traore (Wolverhampton Wanderers) right footed shot from a difficult angle on the right is saved in the bottom right corner. Assisted by Raul Jimenez. Posted at 70' Substitution, Burnley. Chris Wood replaces Sam Vokes. Posted at 68' Johann Berg Gudmundsson (Burnley) is shown the yellow card for a bad foul.Posted at 67' Raul Jimenez (Wolverhampton Wanderers) wins a free kick in the defensive half.Posted at 67' Foul by Johann Berg Gudmundsson (Burnley).Posted at 67' Corner, Burnley. Conceded by Willy Boly.Posted at 67' Attempt missed. Matej Vydra (Burnley) right footed shot from a difficult angle on the right misses to the left following a set piece situation.Posted at 66' Foul by Ruben Neves (Wolverhampton Wanderers).